The first Arabian 100, a new class of 105' trimaran, has arrived in the southern city of Salalah in Oman for final assembly. 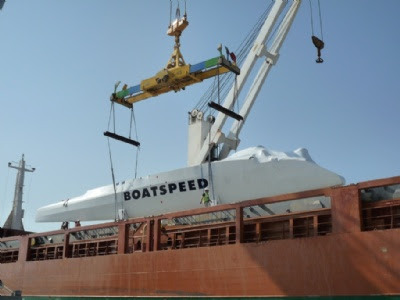 Built by Boatspeed in Australia, the three hulls and connecting beams were shipped on deck to Salalah via India. 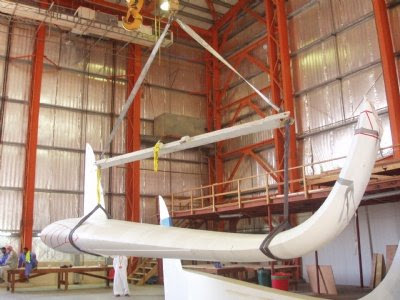 On Saturday the 2nd of May, the parts were transferred to the custom-built shed in Salalah in the Royal Yacht Squadron compound where the fleet of yachts belonging to His Majesty Sultan Qaboos is maintained. Over the next four months the spars will arrive fro m Southern Spars in Auckland, New Zealand whilst the Harken deck gear and winches will arrive from Italy. Before the trimaran is launched at the end of August for sea trials a full set of North Sails will arrive from France. Originally designed by Nigel Irens and Benoit Cabaret, the Arabian 100 is a close sister ship to the very successful and very famous 'Sodeb'O' campaigned by Thomas Coville. 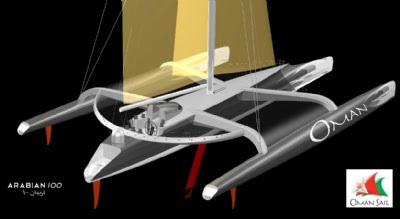 Sodeb'o has set many records around the world and her design was a perfect platform on which to develop a new class of racing trimarans that also offer perfect training platforms. The as yet un-named Arabian 100, His Majesty will name it on completion, will be used by Oman Sail to further the profile of Oman internationally whilst training a new generation of young Omanis. Without the rotating mast of Sodeb'O and the simplifying of some of the processes, the new trimaran will easily accommodate a large crew of trainers and trainees on short or long distance challenges. The Arabian 100 will be part of the programme which will involve long distance races as well as being an international ambassador of Oman. An Omani crew who will be trained to sail the Arabian 100 but there will also be a strong Omani contingency in the background doing the boatbuilding, maintenance, systems, rigging and sailmaking. A cornerstone of Oman Sail's charter is the development of young Omanis in the larger scheme of reigniting Oman's maritime heritage. The Oman Sail Academy is in the second phase of recruitment for young Omani men and women, may of whom will be part of the Arabian 100 crew when she starts her schedule of events.